Catalog Page 60. Accessory Index and t-shirt colors, sizes and pricing. The Accessory Index is used for locating accessories in our online catalog. There is no minimum for blank accessories. 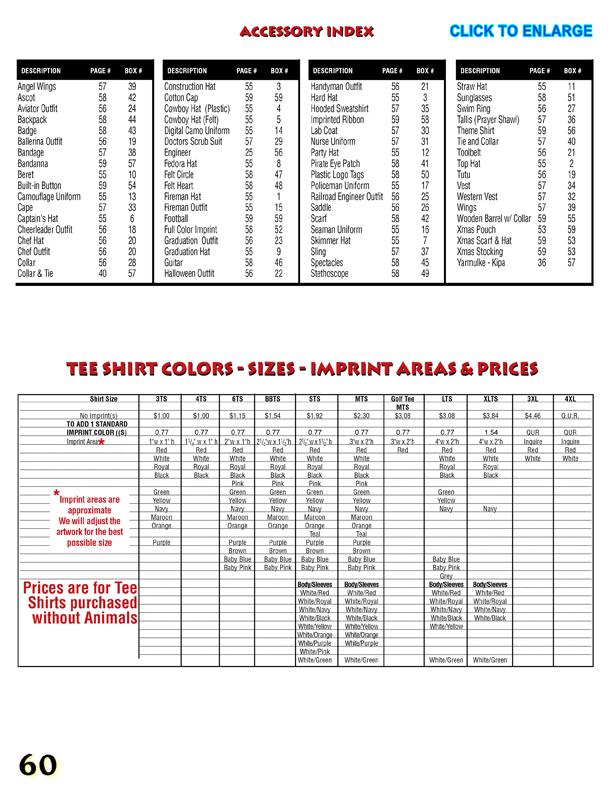 The bottom portion of page 60 shows all the t-shirt sizes, colors, print areas and pricing we offer. One-color printing onto a blank t-shirt is $0.62 per piece. Multicolor printing onto a blank t-shirt is $1.39 per piece. We offer t-shirts for small and large teddy bears. Use the chart above to determine your pricing. China teddy bear manufacturer. Custom plush toys and OEM manufacturing.